Ava Gardner Museum celebrates Ava as a fashion icon with new exhibits and special guest Justin LeBlanc. Each year the Ava Gardner Museum celebrates the opening of the permanent home for the museum in Downtown Smithfield. This year’s festival will showcase new exhibits on the legacy of Ava Gardner&apos;s fashion style with the opening of the "Ava&apos;s Closet" exhibit with music, films, fashion, food and local designer, Justin LeBlanc. 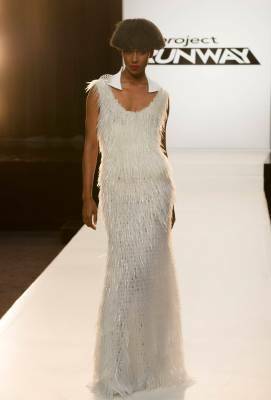 To connect to the fashion industry in North Carolina, festival organizers invited Project Runway&apos;s Justin LeBlanc to attend the event. Justin will be at the festival Saturday, October 4, from 9-11am to host a talk on his signature 3D printing process for fabrics and to discuss his fashion line with visitors to the museum. “We are thrill to have Justin LeBlanc visit this year&apos;s festival, we are big fans of his work," said Deanna Brandenberger, Museum Director, “Ava&apos;s popularity and influence on today&apos;s designers like Justin remains strong and we wanted to contrast modern design with the Golden Age of Hollywood&apos;s designs worn by Ava. It was clear he was well-liked as a contestant on Project Runway, and we feel visitors will enjoy meeting him." Justin’s 2014 Spring/Summer collection shown in New York was entitled “Sound Waves.” It reflected his journey from deafness, represented by pure and simple white garments, to the chaos of sound, represented by garments accentuated with depictions of sound waves, random splashes of white, and elaborate 3-D printed belts, to his ultimate reconciliation with sound, dramatically depicted by a Gown made from Pipette Tips that sounded like rain as the model walked. Justin will be bringing this piece to the museum and visitors will have a chance to see this gown and learn more about the process of constructing this one-of-a-kind design. Justin has a degree in Architecture from North Carolina State University where he was a Caldwell Fellow. Towards the end of his architecture studies Justin developed his passion for fashion design during his participation in NCSU’s annual Art2Wear competition. Following his graduation from NCSU Justin attended the School of the Art Institute of Chicago where he received a Master of Design in Fashion, Body, and Garment in 2012. While a student at the Art Institute, Mr. LeBlanc interned in London at Alexander McQueen’s fashion studio. He was mentored by Nick Cave, a design professor at the Art Institute and a celebrated fabric sculptor. Justin currently resides in Raleigh, North Carolina where he is an assistant professor at North Carolina State University in the College of Design. Justin also is actively involved in fashion design and he is a frequent guest speaker and volunteers his time for various charitable causes. To make the weekend&apos;s event a complete package individuals may purchase passes to all events for $75.00 which includes the Friday night Fashion Fling reception, admission to the museum Friday, Saturday and Sunday, Saturday night Clayton Piano Festival and one heritage tour on Saturday. Advanced reservations required by September 26 to schedule the package. For more information about the festival and to purchase the "Ava&apos;s Closet" Festival Package, please call the museum at 919-934-5830. The Ava Gardner Museum is located in downtown Smithfield, at 325 E. Market Street and more information may be found on the museum website, www.avagardner.org. The museum is open Monday-Saturday, 9am-5pm and Sunday 2pm-5pm with admission of $8.00 adults, $7.00 seniors and groups and $6.00 children.